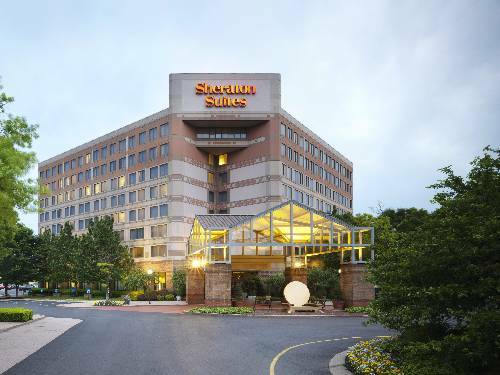 Experience the newly renovated Sheraton Suites Philadelphia Airport. Relax in our spacious and modern suites, featuring the renowned Sheraton Signature Sleep Experience, ergonomic desk chairs and plasma TVs. Connect to work or home with high speed Internet access, PC work stations and more in our lobby. Reenergize after a long day or flight at Sheraton Fitness or refresh in our pool. Try a great meal or drink in our Vector Restaurant & Lounge, a great place to connect with friends and loved ones. For quick bites, coffee and beverages on the go, stop by the Vector Grab & Go. We've thought of everything you need for a relaxed and memorable stay. With easy access to and from Philadelphia International Airport on our complimentary shuttle, we are also convenient to all of downtown Philadelphia's attractions, including Independence Hall, the Liberty Bell, the historic district and shopping and cultural destinations. Welcome to Sheraton Suites Philadelphia Airport an upbeat and refreshing hotel experience. Vector Restaurant and Lounge: Enjoy local flavors of Philadelphia at Vector, where all ingredients are fresh and top quality with a variety of dishes. Complement your meal with drink, from a great selection of beers on tab, including some Philadelphia favorites.